Published: Nov. 8, 2018 at 03:00 p.m. Updated: Nov. 8, 2018 at 03:57 p.m.
Want to see the numbers behind the numbers? Nick Shook dives into a fresh batch of Next Gen Stats and identifies figures that helped shape Week 9. The Rams are one of the most predictable offenses in the NFL based on personnel, and yet, they remain extremely difficult to stop, because that same theorized predictability also leads to them doing almost anything out of a familiar offensive set. Take Todd Gurley, for example. All of Gurley's 182 rushes this season have come in 11 personnel (one tight end, one running back), and 96.2 percent of those attempts came when Jared Goff lined up under center. This isn't a giveaway that Gurley might run, though, because defenses aren't defending it as such. Gurley has faced a loaded box on just 9.7 percent of rushes (lowest in the NFL), and 51.4 percent of his attempts have come against light boxes (six or less defenders). 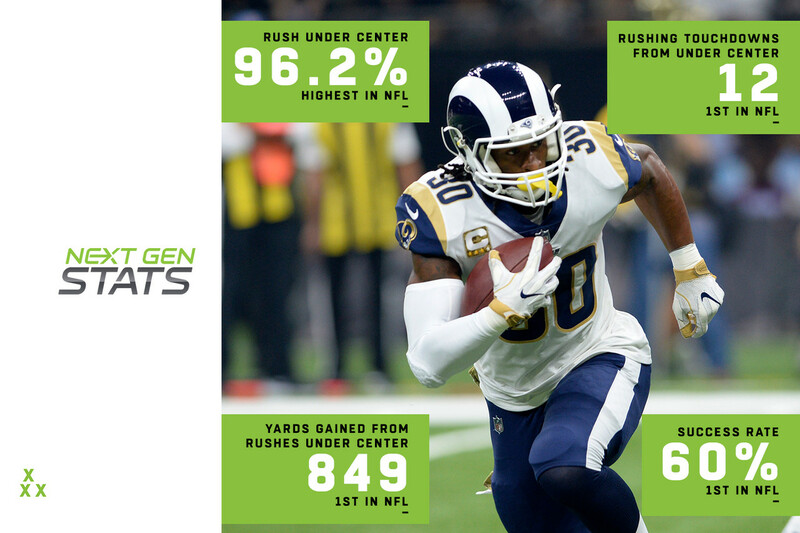 As a result, his under-center rushes have produced the most yards (849), rushing touchdowns (12) and the highest success rate (60 percent) in the NFL. Tom Brady has pushed the ball downfield on third down more than the average NFL quarterback, throwing for an average of 4.0 yards past the sticks in such situations. A big reason why: Brady faces the least yards to go among passers making similar third-down attempts, at an average of 5.6 yards. That has helped Brady throw nine touchdown passes on third down, the most in the NFL, and made the Patriots an offense that is dangerous on any down. Kansas City has blown the doors off much of the league this season thanks to its frenetic pace and high levels of efficiency, and the Next Gen Stats bear that out. Look no further than quarterback Patrick Mahomes, who leads the NFL in four categories on passes he throws in 2.5 seconds or less: completion percentage (83.9), yards per attempt (10.1), touchdown-to-interception ratio (13:0) and passer rating (138.9). The most impressive of those numbers is the yards-per-attempt mark, because that means Chiefs receivers are gaining space off the line early and often throughout the course of a game. At that rate, the Chiefs stand a good chance against Cardinals defensive end Chandler Jones, who ranks fourth in the NFL in pressures (87) since 2017. Cincinnati is good at pressuring the quarterback (tied for fourth in the NFL) but isn't good against short, quick passes. The Bengals play the Saints and short-pass master Drew Brees in Week 10, setting up what could be a rout by a thousand little cuts. When Cincinnati doesn't pressure the quarterback, the Bengals are allowing a passer rating of 102.7 (20th in the NFL). On throws of less than 10 yards, the rating is 102.1 (24th). And worst of all, on throws released in less than 2.5 seconds, the opposing passer rating is 106.8 (27th in the NFL). Brees, meanwhile, crushes all those categories: He averages 6.7 air yards per attempt (second-lowest in the NFL), 2.58 seconds to throw (lowest) and a pressure rate of 15.6 percent of pass attempts. It's simply difficult to get to Brees and cause the problems the Bengals thrive on creating, setting up for a bad day at the office. The Bears haven't had all-world pass rusher Khalil Mack in the last two weeks, but they've managed to turn up the pressure in his absence. The difference, though, is in how much effort they've given to get to the quarterback. Chicago's blitz rate has jumped from 18.6 percent of defensive snaps from Week 1 to Week 7 to 27.7 percent in Weeks 8-9. It's producing a lower passer rating (91.7 to 70.1), but it has also added responsibility to Chicago's defensive backs. That hasn't hurt them -- yet. They'll look to do more of the same against Detroit, which allowed a season-high 17 pressures and 10 sacks last week in a loss to Minnesota. Let's dive deeper than just receiving yards for a moment. We all know about the talents of players such as Michael Thomas and DeAndre Hopkins. But what about Austin Hooper? Or Cole Beasley? Or Kenny Golladay? Thomas, Hopkins, Hooper, Beasley and Golladay are all among a group of just seven players to catch 10 or more percent of targets above their expected catch percentage (minimum 40 targets). Thomas leads the way by a wide margin, at 18 percent, but then you'll find Hopkins and Hooper just one-tenth of a percentage point apart (12.5 and 12.4 percent), Beasley at 11.4 percent, Devin Funchess at 11.0 percent and Golladay tied with Adam Thielen at 10.7 percent. The lesson is this: We're nearing unprecedented levels of receiving talent in the NFL. It took nearly half a season, but we have a new speed champion. Dalvin Cook, come on down! The Vikings running back became the first ball carrier to break 22 mph (New England DB Devin McCourty broke it in Week 8 on an interception), hitting 22.07 mph on his 70-yard run against the Detroit Lions. The most surprising part of this achievement, though, is the fact Cook was tripped up 5 yards shy of the end zone by Lions safety Glover Quin, who had to reach 21.29 mph to stop him.